10th July 2008. In this Issue: Ningaloo Future Uncertain, New Article - Fishing Spots in Australia, Update on the ExplorOz Survey Competition and Activities Voucher Winners. This newsletter combines our usual features plus a firsthand account from David and Michelle who were at a meeting at Ningaloo Station yesterday. The 272 people in attendance were there to hear the results of a battle against DEC to save Ningaloo Station from a massive tourism development scheme. Ningaloo desperately seeks your help. Copy this newsletter to your friends and family and make an effort to write a letter expressing your dissatisfaction to the government process and send it to Hon Alannah McTiernan and Hon Robin McSweeney and your local MPs. Turn your laptop computer into a portable navigation system! When combined with navigational software such asOziExplorer orTrackRanger, route planning and digital navigation can be done at the touch of a button. 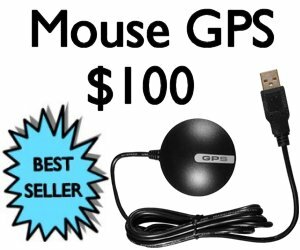 For more information on how to use your laptop with a GPS, be sure to read our Navigation Article. 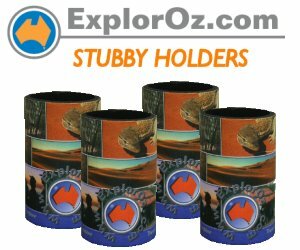 Whether you drink beer, soft drink or water - don’t be caught out without an ExplorOz stubby holder. Designed to stimulate conversation about where you've travelled, featuring a collage of vibrant colour photographs of places and icons in Australia, along with the ExplorOz logo. A bargain at $6.50 each, or $20 for a 4-Pack. Order today! The ExplorOz Trader is proving to be a very popular medium for buying and selling items, and we often receive great feedback from people who have used it. If you would like to set up an ad, simply choose the type of listing and then fill in your listing details. Once payment for the listing is received, your ad will be shown. Easy!!! Click for the Trader. Although Ningaloo Station was successful in renewing their lease to 2064, the DPI are now putting a conditional clause to claim land for ‘public purpose’. The DEC has staked a claim for 48% of the 49,500 hectare station for Ningaloo Marine Park. This controversial plan includes developments of massive tourism nodes and the end of beach frontwilderness camping at Winderabandi Point, South Lefroy Bay and Jane Bay. It would also see the total removal of three generations of family heritage and pioneering livelihood. People power is the last chance to save Ningaloo in its natural state. Wow!!! what an incredible response we’ve had for the ExplorOz Survey with 3,226 entries in total. All entries are now in the judging stage where 10 lucky people will be selected - each winning a WAECO fridge/freezer worth $1199. Thanks to all who entered. Good luck and most importantly - stay tuned! We recently held a competition with 5 x $50 activity booking vouchers up for grabs. Well - the results are in, and our winners are: Julie K, Rod D, Tenielle O, Linda T, and Mim D.
Have you searched for activities on ExplorOz lately? Find over 1600 tours and activities across Australia with real time availability and instant booking. Click toSearch for Activities.